Delicate gypsophila flowers add texture and an air of romance. 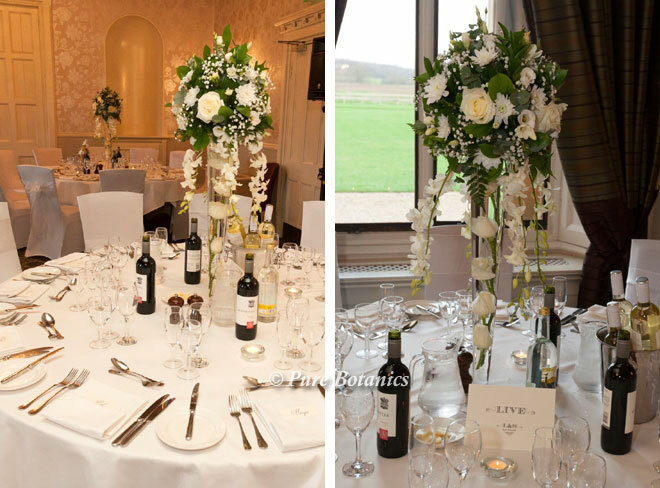 Here you can see the wedding flowers that we created for Laura’s February wedding at Walton Hall. The couple have very generously sent me these amazing wedding photos to share with you. I love the photo above right of her happy smile as she walks down the staircase looking stunning. 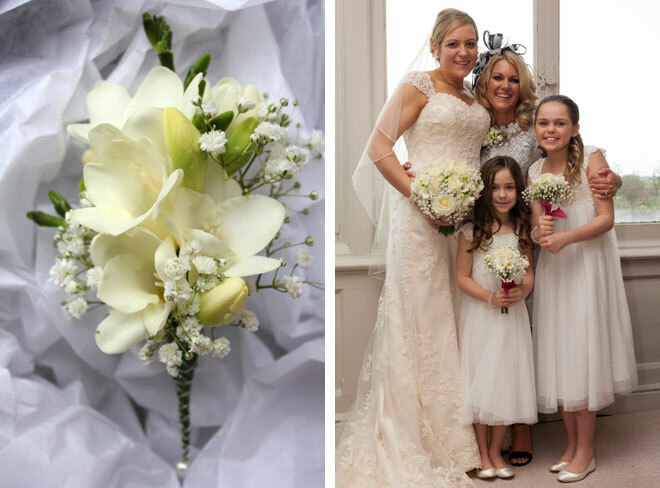 I created the posy bridal bouquet by combining ivory roses, freesias and gypsophila. 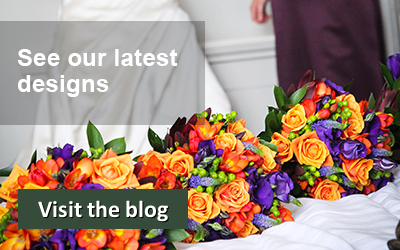 These became the base flowers for all the bridal bouquets and table arrangements. 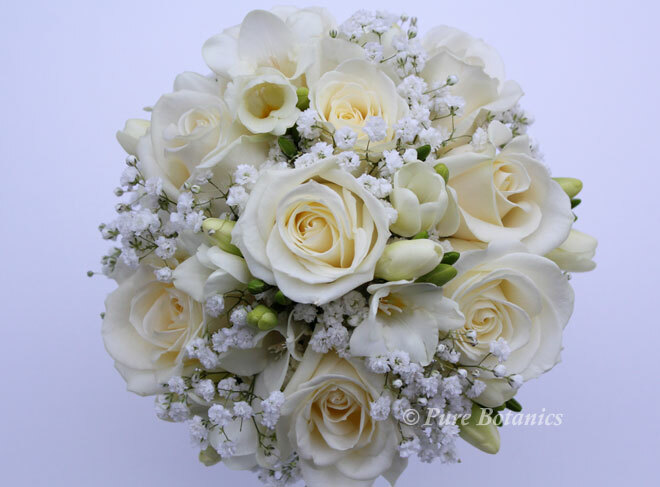 This is a lovely combination of flowers that work well together, the gypsophila gives texture, the roses add elegance and the freesias provide a beautiful fragrance. 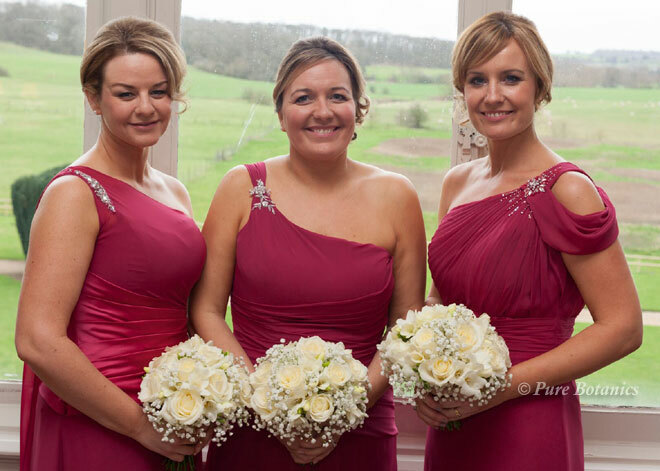 Our bridesmaids’ bouquets are smaller than the bridal bouquet but still large enough to add impact to the wedding photographs. 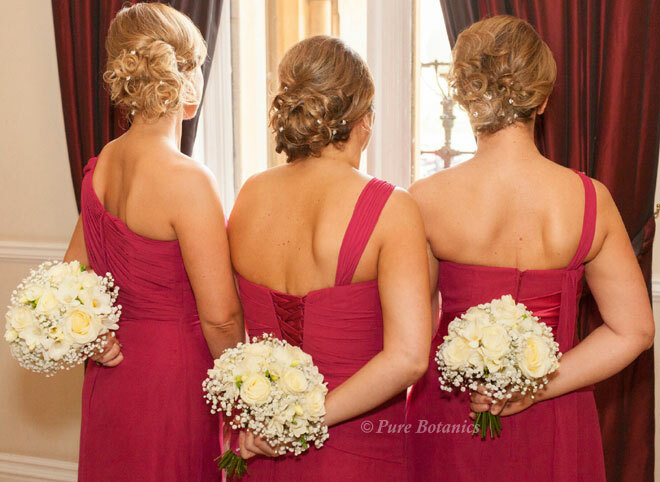 These bridesmaids are holding their posies perfectly. I think this is a great fun photo (above) and I especially like how the diamante clips in the girls’ hair have the same delicate look of the gypsophila in their bouquets. 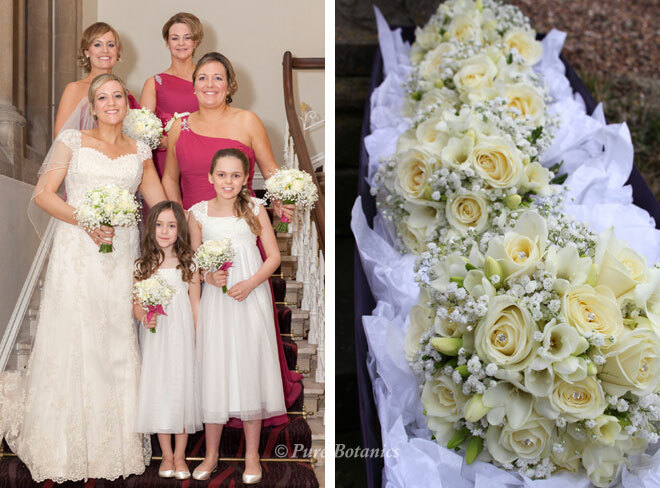 Young flower girls often have smaller posy bouquets that are similar to the adult bridesmaids. In the photo below right you can see how adorable they look. 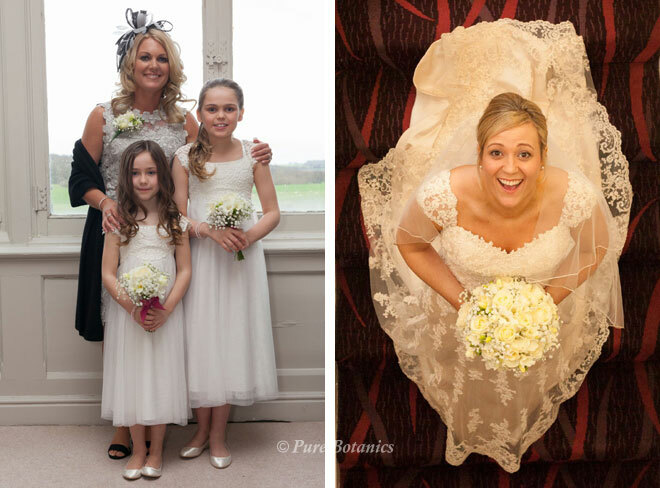 In the photos above you can see Laura’s mum’s corsage also made with the same flowers as her daughter. Our lapel corsages are made on magnets so that you don’t have to make any pin marks on the outfits. Gypsophila is also a popular choice for gent. Above you can see how I have combined white freesias and gypsophila to create the buttonholes for the groomsmen. This photo is taken outside St James’ Chapel at Walton just a stroll away from the hall. Tall wedding centrepieces are a wonderful choice for the wedding breakfast room at Walton Hall as the Moncrief room has such high ornate ceilings. These arrangements add impact and wow factor. 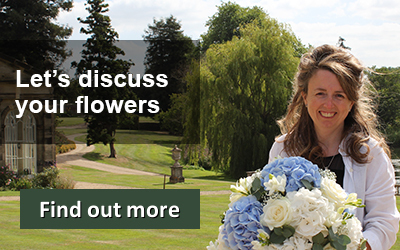 You can see more examples of our wedding flowers at Walton Hall on our featured page. 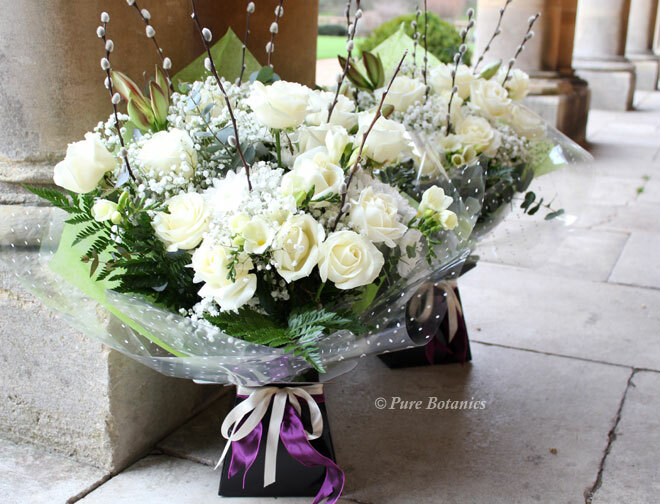 Saying thank you with our beautiful aqua pack bouquets is a popular choice to give during the speeches. I’ve created these to coordinate with the rest of the wedding flowers so memories of the day are continued for days after the wedding. Feedback like this is what makes my job so rewarding.